KATHMANDU, March 2: Cumbersome tax filing process is one of the major hurdles for businesses and start-ups in the country, according to entrepreneurs participating in the "5th Young Entrepreneur Summit – Women 2019" held in Kathmandu on Friday. Pointing out to the complex tax filing process of the country, they also said that the lack of knowledge on accounting and procedures of paying taxes at multiple layers made it difficult for small and medium enterprises as well as start-ups to grow. Speaking at the summit, entrepreneurs remarked that they had to struggle to find investment or financing services for operating and expanding their businesses. Some experts advised women entrepreneurs to go for long-term business relationship with investors and focus more on branding in the initial phase. Alongside, experts also advised the participants on the process for incubating and expanding business in Nepal. Overcoming the gap in the educational system to develop an entrepreneurial mindset in the upcoming generation was an extensive part of the discussion. The summit was organized by Nepalese Young Entrepreneur Forum (NYEF) with an aim to provide a platform for existing female entrepreneurs and increase the scope of opportunities for the aspiring ones. During the summit, Laxmi Bank Ltd announced a specialized loan scheme at a subsidized interest rate of 6.5 percent. The loan scheme was introduced to improve business start-up environment in the country, according to Bharati Pande of Laxmi Bank Ltd.
Over 150 participants, mostly women entrepreneurs, participated in the summit held with the theme of "Connect, Collaborate, and Create". During the summit, prominent women entrepreneurs shared the stories of their business journey. 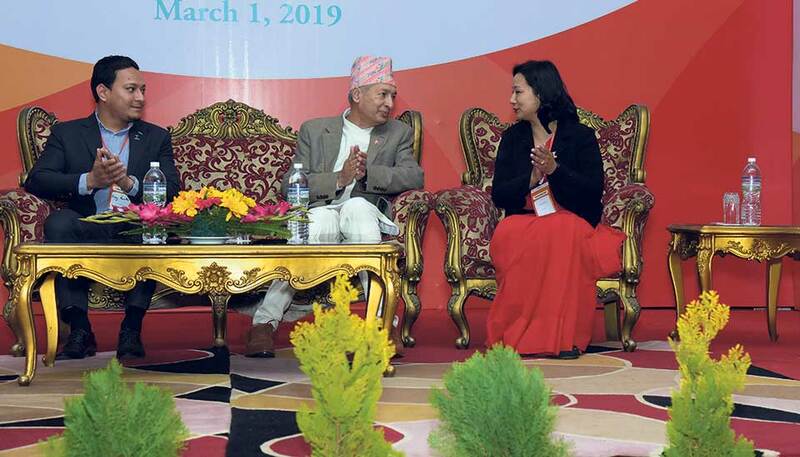 Addressing the summit as a keynote speaker, Minister for Finance Yuba Raj Khatiwada highlighted the importance of women entrepreneurship to spur economic growth in the country.